How popular was Facebook in 1850? If you think this is a stupid question, think again and ask Wolfram Alpha. It wouldn’t lie to you, would it? Thanks piotr_mil for this Wolfram Alpha fail! It is a bit confusing, but that is not what the graph is saying. 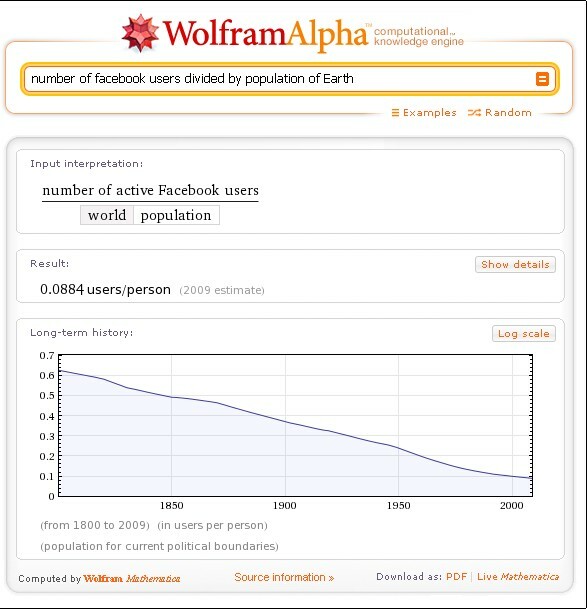 The Facebook number is a single value, but the world population is a time series. The graph is showing the current number of Facebook values over the world population of each of those dates. It is not indicating that Facebook existed during any of those times.